Info Respected TV news reporter and commentator noted for his wry wit, low-key authoritative delivery and polished writing style. A mainstay in TV journalism for four decades, Reasoner began in print as a drama critic and newspaper reporter. In 1956, he joined CBS News, where he stayed until 1970 when he became one of the first news stars to jump networks. He co-anchored the "ABC Evening News", first with Howard K. Smith and later with Barbara Walters, the first woman co-anchor of a nightly network newscast. In 1978 Reasoner rejoined CBS's "60 Minutes", where he continued his investigative stories and interviews. 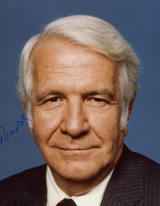 Reasoner died shortly after he retired in 1991.